Time for new contract discussions at Rafa the Gaffer's terms. He better beg for a new contract! Because he isnt getting hired by any bog club ever! and I can see he is begging for money to spend spend spend again! sheeeet on a steeek! Fat man, sheet on a steek manager, relegation on his CV. you posted that before. running out of material ey? Fat Ugly Hapless Useless Sheet-on-a-Stick coach, Rafa Benitez loses again! 4 games in a row! what a worthless loser with puss coming out of his rotten face. CIC old toto, so no comment on a 4 game losing streak for the best coach in the league? Hmm Danfo abeg ..tell us wetin Rafa do you ? Your hatred for the man no get equal. I am just curious and seek some edumafication..
i am just a truth talker o! He was Kaycee2G when Borinho first came to Chelski. Then Yaya when Borinho went to Inter. Then Okokoborinko when Borinho went to Madrid. And now Danfo Driver when the object of his groupie love returned to England. Oga CIC, why dont you want to speak of the 4 game losing streak of Fat Ugly Repulsive Sheet-on-a-stick, Fat Rafa Muffin? Whyyyyyyyyyyyyyyyy?????? isnt he the coach of the decade? Txj once called him "the best tactician in Europe," You, call am "The best coach of the season of life of amazingness sweetness"
The only time he could have use Rafa to waya me slap, it was his match-fixing lover that was beaten like a rogue! Sheet-Eye-Sheet o!!!! Wetin you do God? Why God despise you like this??? 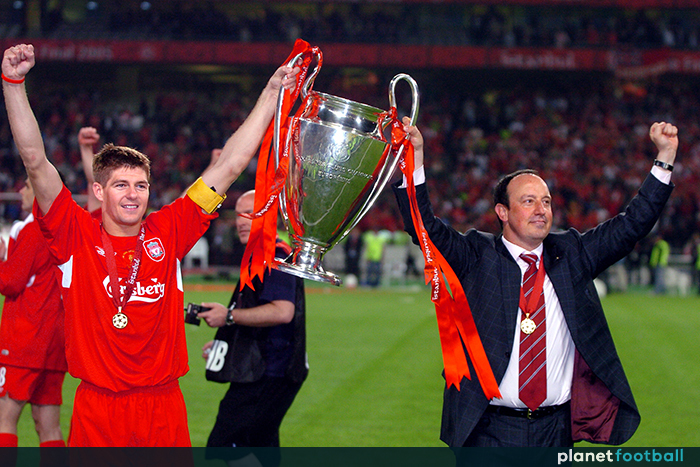 “I would like to thank Rafa Benitez for his magnificent achievement this season. Haters, come and feel the love from a real fan. Newcastle United is as famous as it is infamous, revered just as it is ridiculed. What is universally accepted, however, is that there is never a dull moment on Tyneside. Many label Newcastle supporters as self-entitled, fickle and hard to please, while others (myself included) remain undeterred in maintaining that, in spite of years of disappointment, it remains one of the sleeping giants of English football. As of late, you would be more inclined to think of it as less asleep and more in a coma. Frustrations have once again begun to bubble on Tyneside and a new fan-led movement has emerged above the trenches at St James’ Park: #IfRafaGoesWeGo. Spawned from of a toxic brew of anger and fear, Newcastle fans up and down the country have threatened to renounce their support for the club if Rafael Benítez is forced out this summer. At the centre of this protest, and like all good soap operas, the hero v villain narrative is fulfilled by two key players: the malevolent tyrant Mike Ashley and man of the people Benítez. Rafa’s disarming modesty, his symbiotic relationship with the fanbase and his all-round majesty has generated a renewed hope and cause for pride in our football club, something which has been missing for a long while. In the two and a half years since the Spaniard’s shock unveiling as manager – arriving just months after vacating arguably the biggest footballing seat on the planet – he has guided a motley crew of relegated misfits to the Championship title at the first time of asking and returned the club to the top 10 of the Premier League all the while turning a £19m profit in the transfer market. However, rumours have emerged in recent weeks that Ashley is refusing to release transfer funds to Benítez until he commits to a contract extension. Benítez, now accustomed to the false-promises and misgivings of the United hierarchy, is supposedly delaying signing an extension until he has seen sufficient evidence to support his and the fans’ ambition. Having been promised investment this summer by Ashley regardless of the status of a possible takeover, Newcastle have mustered just one addition to the squad, with Ki Sung‑yueng arriving on a free transfer from Swansea. The Swiss defender Fabian Schar is also likely to sign soon but at £3m is hardly a marquee purchase, while the other arrivals are Kenedy and Martin Dúbravka, who finished last season with Newcastle. Outside of that, the club have generated at least £15m from the sales of Mikel Merino and Chancel Mbemba. When you consider that the club’s transfer record has stood for 13 years – the £16m spent on Michael Owen in 2005 – it is hardly surprising why such unsatiated ambition has starved us of positivity for so long, leading to fans on social media involving themselves in a “brand hijacking” campaign, swamping social media posts by Sports Direct and Mike Ashley’s PR agency of choice, Keith Bishop Associates, with disparaging comments. Whilst some people might turn their nose up at fan-led protests, there is no denying the purpose or intent behind it. Victor Hugo famously said “not being heard is no reason for silence”, and this mantra could not be truer of the Newcastle fanbase. Indeed, the message has been so loud and clear that the Newcastle Central MP Chi Onwurah delivered a petition to parliament on Tuesday to prevent Ashley from his continued exploitation of the team. “The House of Commons urges the Government to prevent unscrupulous football club owners from exploiting clubs, their fans and local communities with particular reference to Mike Ashley and Newcastle United football club,” she said. It is not uncharacteristic for fans to be left in the dark as transfer and takeover dealings are often brokered discreetly behind closed doors and by lesser-known administrators. What is perhaps most frustrating this time, however, is that for the first time in a long while we have something to cherish in Benítez – a manager who we adore and who returns that adoration in equal measure. If mismanagement and miserly incompetence threatens that, then expect the fans to roar. As this Shakespearean tragedy trudges on, we have to hope that this most recent episode is one of the last under Ashley’s calamitous and damaging reign. The peripetieas of the drama have been excruciating, scandalous and downright embarrassing at times, and a change in ownership couldn’t come sooner. Crucial to surviving and, whisper it, flourishing in the top flight is Benítez, whose continued faith in the club and the fans, in spite of all else, is remarkable. He is so much more than a great manager: he is hope. He is the thread by which the fan base is hanging, and if he goes, we go. It may be a cliche to hark back to the Geordie-coined “we don’t demand a team that wins, but a club that tries” mantra but, quite frankly, I don’t care. Ashley’s 11-year reign at the club has amounted to a series of unfortunate cliches and it’s high time we got off that train of wearisome disappointment. Harry Savill is editor of The Spectator’s View, a Newcastle United fanzine.